My sweet husband took me on a ski vacation with our friends. I don’t ski. They all do. However, I enjoy travelling and having alone time to write. So, I am tucked into the condo pounding away at my little keyboard. My short story, A Tail of Two Doxies is with the editor. Gretta and Irene rescue two abused dachshunds. Of course there is drama, but there are no dead bodies in this one. It’s just a taste of Skeeterville until the next story is out. I plan to have this out at the end of April. Now I am focused on Hiding Miss Daisy, the next Skeeterville novella. Of course, Irene is a big player in this story. since she is Daisy’s cousin, she takes extra care of her. Daisy and Mildred are the oldest residents at the Friendly Arms Apartments. This time Irene will go undercover at the nursing home when there is unexplained death occurring. In this dear little town of Eden, Utah, the dining options are limited but tasty. One interesting jewel we found is Carlos and Harleys, a biker bar/Mexican restaurant combo. The food is good and the beer is cheap. They make a decent ice tea, too. Their decor will keep you busy reading the signs on the wall. In the center of the room is a statement piece that left me in awe. 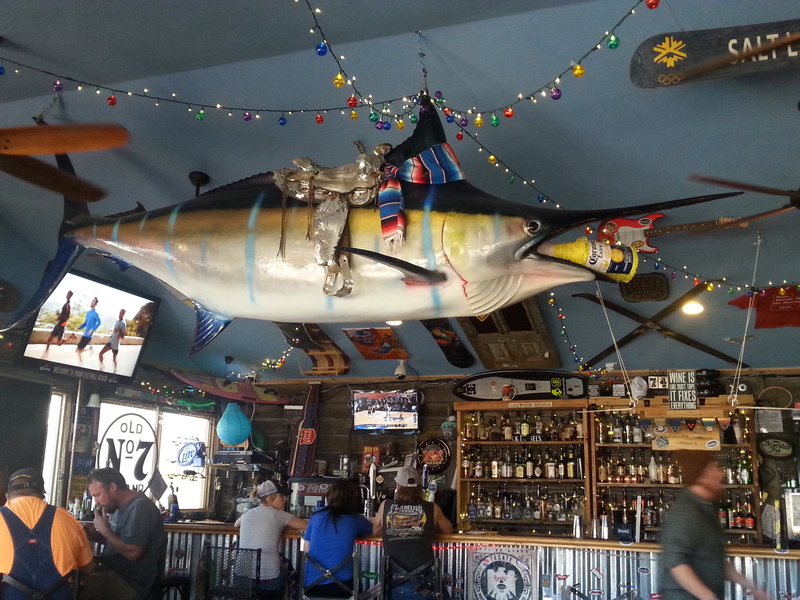 Yes, that’s a swordfish with a silver saddle and a Corona pinata in its mouth. I have never seen that before. Interesting use of an unusual object. We have eaten here twice. Posted by TeresaQuill on March 31, 2015 in Uncategorized.